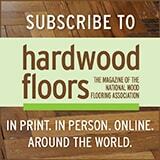 I previously wrote about sanding grit sequences on exotic hardwoods. Coincidentally I have a project going on with Brazilian Walnut, also known as Ipe. With the typical exotic production overwood, it gave me a great opportunity to photograph how certain sanding procedures can be modified to a more efficient outcome and end product. In this first photograph, you’ll see how uneven the end and side joints are. Easily exceeding 1/16th of an inch differential of overwood. 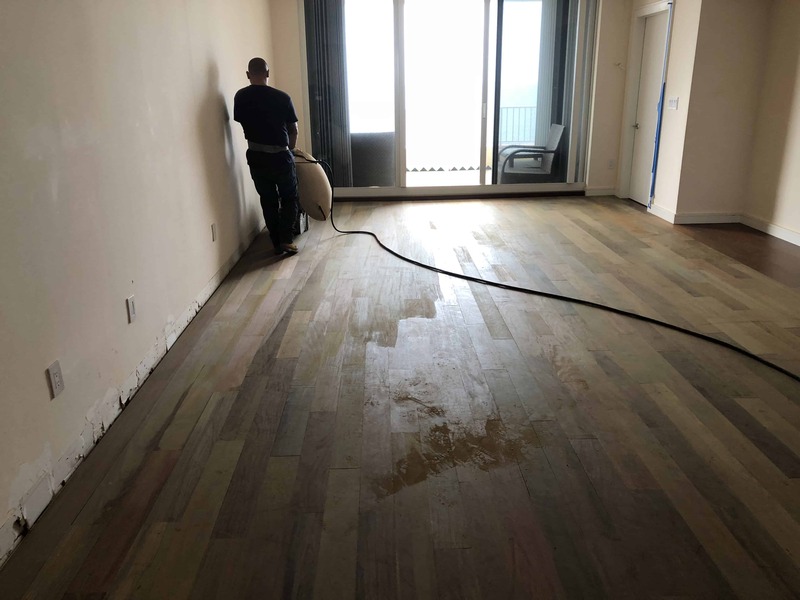 The belt sander was fitted with 50 grit sandpaper, while using high pressure, walking in a normal walking pace as would be typical of the red or white oak floor, and advancing passes of ½ a drum, you can see that there still remains low boards and low edges. This is what happens when an operator doesn’t change their methods for the floor been worked on. 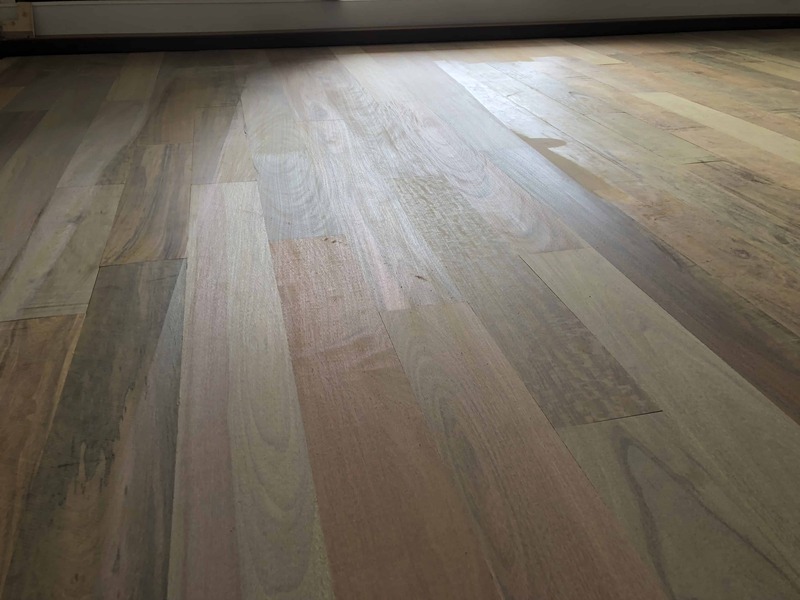 In this photo, the belt sander was fitted with 60 grit sandpaper still on high pressure setting, walking pace was half the speed of a normal Red or White Oak walking pace, and advancing only 2 ½ to 3 inch in each pass. Please note the benefit of this minor alteration in technique, in that I leave a finer grit scratch that is not as the deep as with 50 grit. Sure, production guys will think moving over the floor so slow is going to reduce profits. But to the contrary, the initial time spent on 60 grit, walking slower with smaller advances, is gained and then some, as future processes compliment the previous processes. Read on! 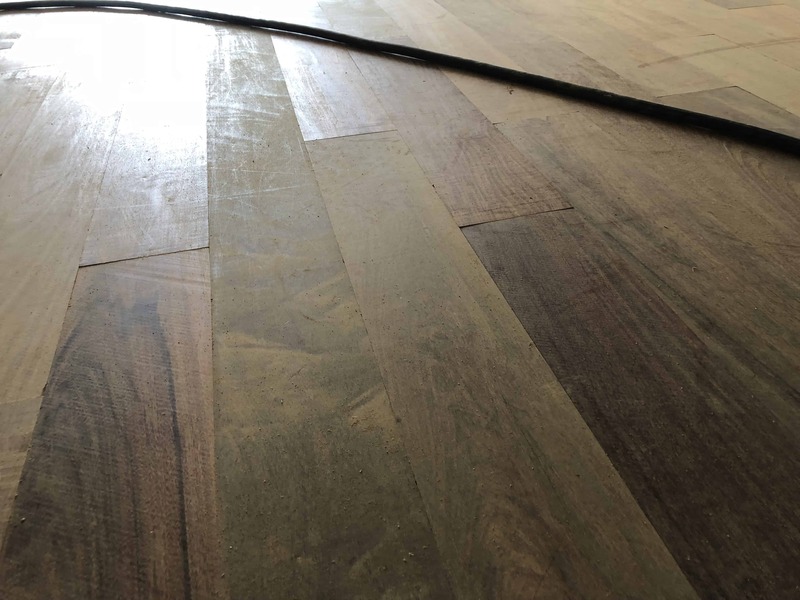 Exotic hardwoods being much denser than North American hardwoods for the most part, have the challenge of removing belt sander scratches with multi heads or hard plates, neither of which is designed to remove a tremendous amount of wood (see side note). Those machines are designed to polish. I know, I know… there are some multi-head machines with beefed up motors that weights can be added to, forcing the mineral into the floor, but in reality, the machines do not have nearly the surface pressure in asking a machine with a larger sandpaper surface area to remove a scratch depth that it just cannot do. The amount of time it would take would be beyond excessive. SIDENOTE: The force against the wood for sandpaper in psi for machines exclusive of operator influence or manipulation are as follows: A typical 8” belt has 3-4 square inches of paper in contact with the floor so under 70# head pressure… that’s a range of 17-23psi. Various edger configurations range from 8-14psi. A 3-pad multi head machine using 6” diameter paper has a range around 1.7psi. Other multi-heads are around .5 – 4 psi. A standard 16” aluminum hard plate on a standard buffer ranges from 0.25 to 3 psi! This is why multi-heads and buffers buff more than remove material… they don’t and cannot get the deep scratches out from several grits prior, effectively. Following the 60 grit belt sandpaper sequence (Ceramic or AlO2), I use 100 grit belt sandpaper sequence (SiC) done at a regular walking pace, under regular pressure with 2-1/2”-3” advances which will remove sufficient wood material to reach down to the bottom of the 60 grit sandpaper scratch. The edger sequence equals the belt sequence. Following the belt and edger as I wrote in the previous article, I follow up with hard plate at the same grit and mineral as finished with the belt and then screen on the same grit and mineral as the hard plate. Look! 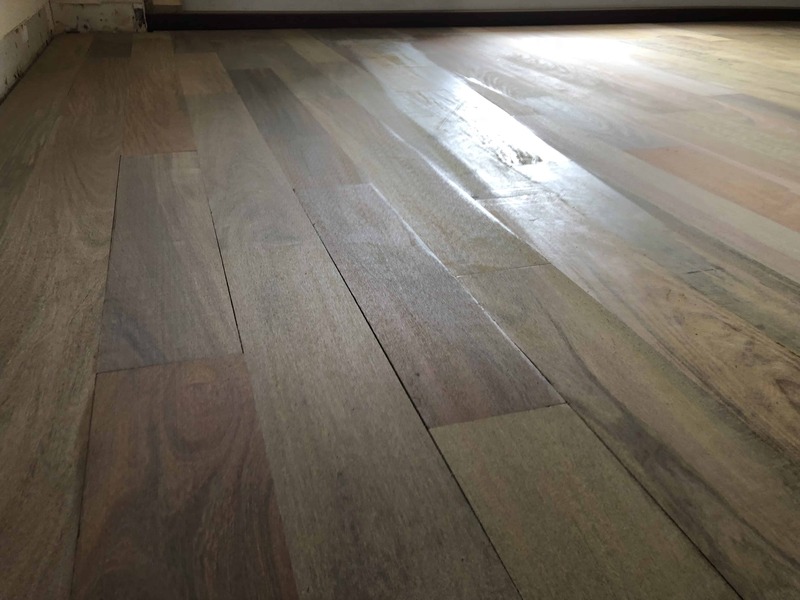 – I’ve cut the floor only 2 times (slower at first but with much less follow up work) where others are cutting 3 or maybe 4 times (and leaving 36 to 40 grit scratches behind) and pushing minerals into the hardwood under heavy multi-heads to clean out the previous work. 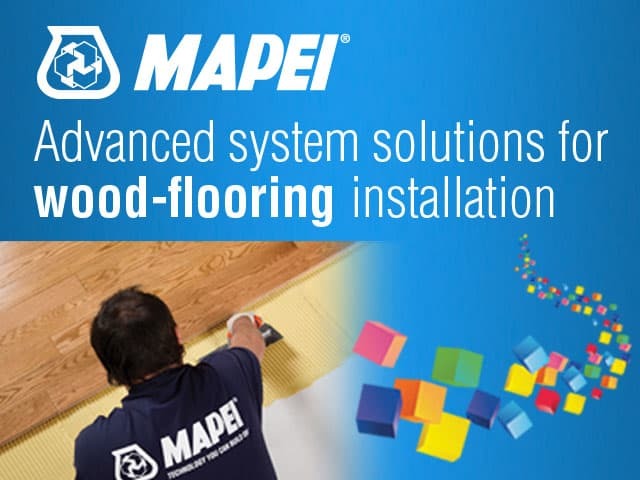 This will give me a flat floor, free of visible scratches and one that finish will sit on nicely rather than soaking into all those micro-crevasses left by the heavy belt grits. I hope the photographs and explanation of my process is helpful and benefits you all to work hard and work less and produce better product for your clients to pay you more for. Hi, thank you for this article. Very logical and informative. Please keep this style of article going.